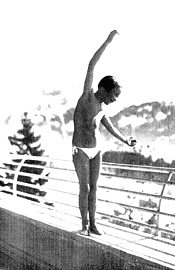 In Sir J. Henry Gauvain's quote, included within a preface to Rollier's 1923 British publication Heliotherapy, sun-therapy is described as little different from sun-worship. In doing so, Gauvain described the highly regimented and surveyed medical processes of light therapeutics as something instinctive and thus natural. Investing in natural means and natural forces was the premise behind heliotherapy and, at least initially, behind phototherapy. Kellogg himself referred to his system as the "physiologic" or "natural" method, yet he warned his readers that the use of simple elements - light, air, water - was by no means a simple task for the layman: "The application of the physiologic method requires much more than simply a knowledge of the technique of baths, electricity, movements, etc. 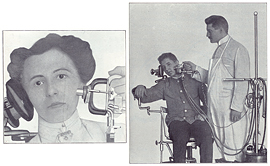 It especially requires a knowledge of physiology, and an intelligent grasp of all the resources of modern medical science" (Kellogg, 1909, p.15). Another contributor to Rollier's 1923 book, Caleb W. Saleeby, put it more bluntly: "In spite of its apparent simplicity, the practice of heliotherapy demands great attention to detail and constant supervision" (p.vii). 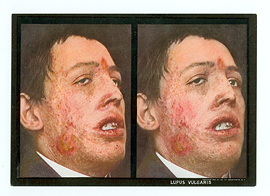 Young patient of Dr. Rollier, frontispiece. 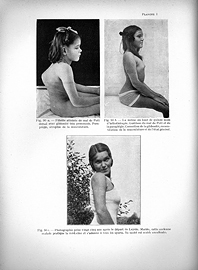 Young girl with Pott's Disease, before and after photographs. 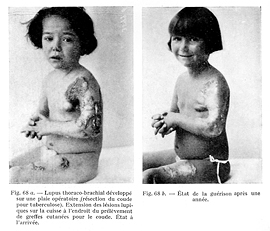 Young child with lupus, before and after photographs. 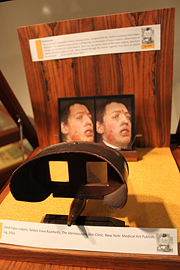 Adult lupus vulgaris, stereoscopic plate.